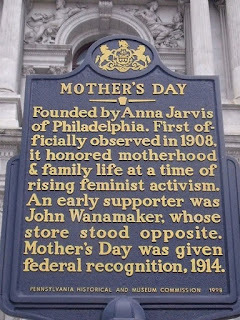 Many people probably don't know that Mother's Day was founded in Philadelphia, by Anna Marie Jarvis. Although Miss Jarvis was born in West Virginia in 1864, she left to work briefly in Chattanooga, Tennessee, and then she joined her brother in Philadelphia, where she worked for a reputable life insurance company (and became their first female literary and advertising editor). Her mother joined her there in 1904, but lived only another year. 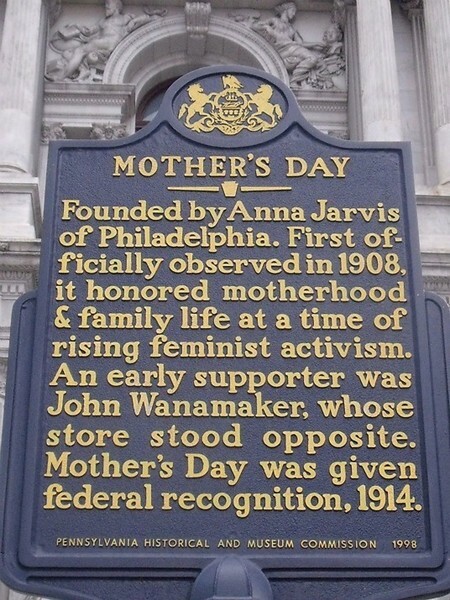 In 1908, Anna Jarvis held a memorial ceremony in West Virginia to honor her mother, as well as all mothers, and that is counted as the date of the first official observance of Mother's Day. I wouldn't have known any of this, but I spent several years walking past the sign in Center City Philadelphia. Ladies, did your mother teach you to cook? Did you cook a meal as a treat for her? Or did you cook side by side in the kitchen? SHEILA CONNOLLY: I give great credit to my mother for introducing me to fresh vegetables in my childhood (at a time when frozen vegetables were becoming popular). I thought artichokes and asparagus were wonderful things, and you could even eat them with your fingers. I wasn't as enthusiastic about avocados. I was cooking simple meals before my teens, but the first full meal I remember cooking for my mother was Thanksgiving 1967--I'd watched her cook a turkey for plenty of years by then. LESLIE: Sheila, what a great picture of you and your mother! Mine was not much of a cook. I realize now that my father's schedule played a role -- he was a traveling salesman, gone from Monday morning to Friday afternoon, meaning dinner Friday was always some version of a casserole, what she with her Minnesota upbringing called "hot dish." Ground beef, onions, macaroni, a can of tomato soup -- you get the idea. DARYL: Sheila, my mother learned to cook after college. I remember finding letters from her to her grandmother (still have them) boasting that she'd learned to make meat loaf and green jello with fruit inside. [Her meat loaf was great; the jello...I'll pass!] After that, however, she became a whiz. She was very bright. She could follow a recipe. She had just never learned to cook as a girl because her mother did it all. I fashioned my character Jenna, in the Cookbook Nook Mysteries, after my mother (as far as that trait was concerned). 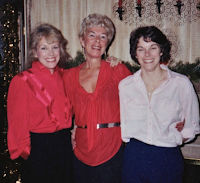 I'm sharing a photo of my mother and my sister, at Christmas. 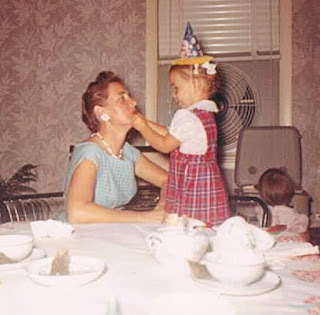 My mom loved to entertain guests, and Christmas was her favorite time. She set out ham and cheese and crackers and then threw together some terrific appetizers. No one went home disappointed. Did she teach me to cook? A bit. I make a mean spaghetti that is her recipe and a great margarita! LOL. But honestly I learned to cook when my parents divorced, and Mom went to work, and someone had to get food on the table. I became quite good at steak and mac-n-cheese. I could throw together a salad. And I made chocolate chip cream pies to sell to the neighborhood. Happy mother's day to all. May you love them fully if they are still alive; may you remember them fondly if they have passed on, as mine has. MARY JANE aka Victoria Abbott I love these stories of your mothers and your early cooking. Until I was married, I could only make tuna sandwiches and coffee. 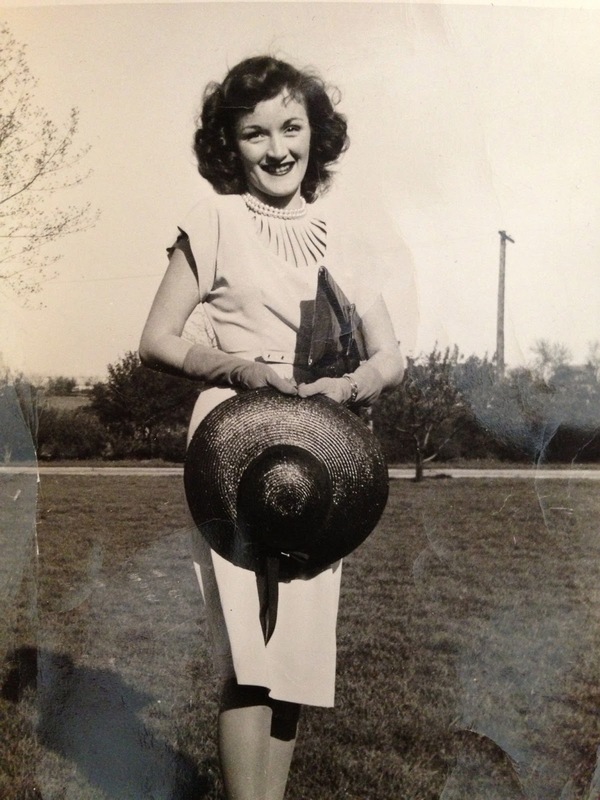 My mother was a gifted cook and I wish I had a picture of her in the kitchen, but then she wouldn't have been wearing one of her glam hats. 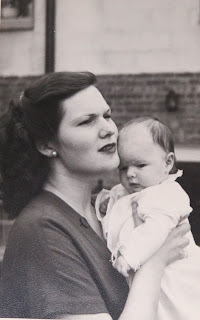 Here we are on Mothers' Day, a million years ago. My mother-in-law and Victoria's other grandmother, a girl from the mountains in the north of Italy, went on to become brilliant in the kitchen and once cooked a meal for the Queen. When they would visit us at the same time, they could get into the kitchen and cook AT each other, competitively. I would just hide out on the sofa reading (and worrying about shrapnel) and enjoy the results. Victoria and I channeled her Maffini grandmother (who is still alive at 95) and her auntie into our Signora Panetone character. "Eat! What's the matter? You don't like it. Many of the recipes from both sides are still family favorites. Mothers' Day always makes me happy/sad. I hope you all enjoy the day with the mums who are still with you and the happy memories of the ones who aren't. LUCY: They cooked a meal for the queen?? Wow, MJ, my mother's cooking wouldn't have made it past the back gate LOL. To be fair, it was the 50's, and Mom worked full time and raised four kids. She loved to eat, and made sure we all got fed, but she didn't love to cook. We were all about cans of vegetables, roasts, and potatoes. And Leslie, the same casserole recipe that your mother used! She had some high points in her repertoire, usually involving a great buffet of little sandwiches, fruit, and cookies. And she went all out for Christmas cookies too. My hat's off to all these mothers who raised amazing daughters! Linda: I'm sensing a bit of a trend here. I don't think my Mom enjoyed cooking although I never asked her. She just made sure we were fed when we needed to be. Sunday after church it was always a roast with mashed potatoes and canned green peas. Most weeknight meals included the necessary potatoes, veggie, often canned cream corn or for a treat -- niblets, and some meat. Unless there was fish. My Dad loved to fish and growing up on the B.C. coast, there were plenty of salmon in those days to oblige him. Where Mom really shined was Christmas. She'd bake amazing-smelling Swedish cookies and breads in preparation and then on Christmas Eve, our meal would be potatoes, peas, and a Scandinavian delicacy (depending on who you ask -- don't ask my sister!) called Lutefisk. I remember it all with fondness. I've grown into cooking over the last few years, much as my character, J.J. Tanner has. Although I think she's better at it! Here's to all our Mom's be they with us in person or in memory. We cherish them. Krista: Like Roberta, I'm very interested in hearing the story about cooking for the Queen! Food and cooking were a very big deal in my family. I remember my father telling my mother that I would never learn to cook if she didn't start teaching me. My mom was a devoted follower of Julia Child and bought all her cookbooks. I didn't start cooking much, though, until I lived on my own. were full of friends from all over the world. My mom and her friends cooked and baked and took great pride in their dishes. They were truly the original domestic divas. I am very blessed to still have my mom with me. These days I do the cooking and baking, and she seems pretty happy about that. To all the moms who are with us, and those whom we remember with such love, Happy Mother's Day! Peg: Such fun hearing these stories about your mothers! My father was very much a meat and salad sort of person (no potatoes even--I think he invented the low carb diet) but he did love the dishes my mother made that came from her mother--goulash, chicken paprikash, stuffed cabbage (my grandmother was Hungarian.) Dessert was something we only had on special occasions so she didn't do much baking. (or to give as a gift in her memory). How lovely for both of you! I agree! My mother always read, and so did my grandmother (my mother's mother). They preferred historical fiction (featuring royalty whenever possible), and swapped books often. My mother was a big reader and she got me hooked on reading at a very early age. I remember reading the books on our bookshelves--most of which were quite old. The greatest treasure though was a copy of Gone with the Wind put out at the time of the movie complete with pictures of Clark Gable and Vivian Leigh. I pretended to be sick so I could stay home from school and finish it! My Mom and I were on vacation one summer and I'd finished all the books I'd brought with me so she gave me one she'd finished to read. It was a mystery by Dell Shannon. I finished it and when we got home read the other 37 books in the series. That pretty much got me started on reading mysteries. 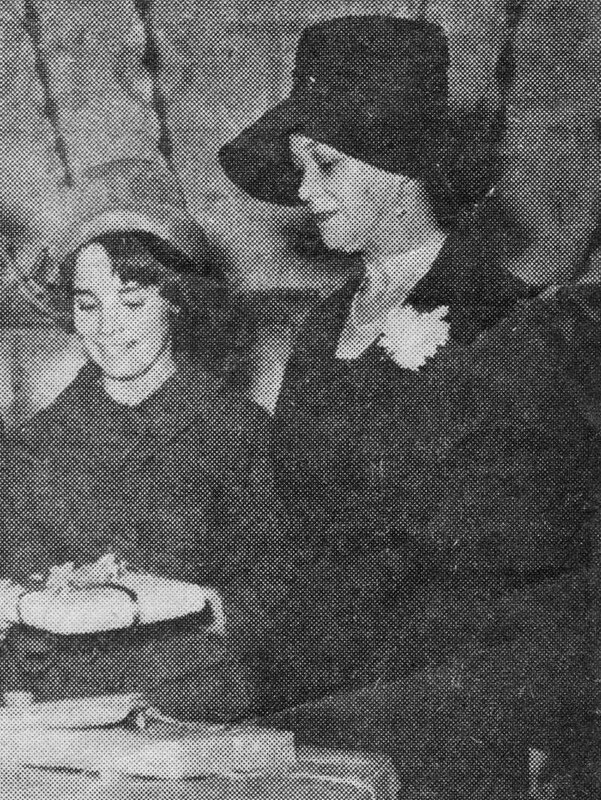 My mother also worked full time as an excellent teacher and raised five successful children. She wasn't very interested in the domestic arts, but did help teach me to sew and tried knitting. She taught me to make pies and encouraged me to cook. My grandmother worked full-time and didn't cook that much except for a few specialties like her tomato sauce and lasagna. My grandfather did a lot of the cooking and they'd both work at making things like dozens of ravioli at once. My mother was a good plain cook, but my father was a meat-and-potatoes kind of guy (from an Irish family), and neither my sister nor I was interested in weird foods. It all worked out fine. So lovely that your mother had a green thumb. My mother always said she married my father after warning him that she accepted his proposal only if he agreed to be the spouse who would be doing the cooking. And he did, both agree and follow through with that promise. 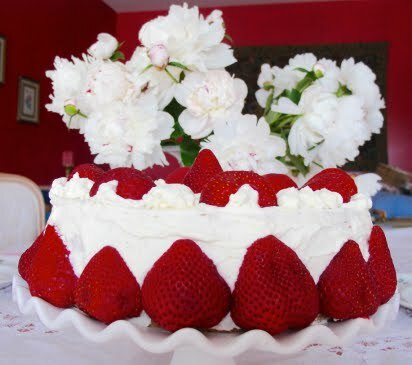 She did however, follow her whims in learning specialty cakes and dishes, as her spirit moved her. It was a harmonious home and both parents taught me to cook from the favorites in their respective repertoires. Little lamb, that sounds simply delightful -- playing to each other's strengths for the yumminess of all! What a good deal. That's how marriage should be! Beautiful post and memories! 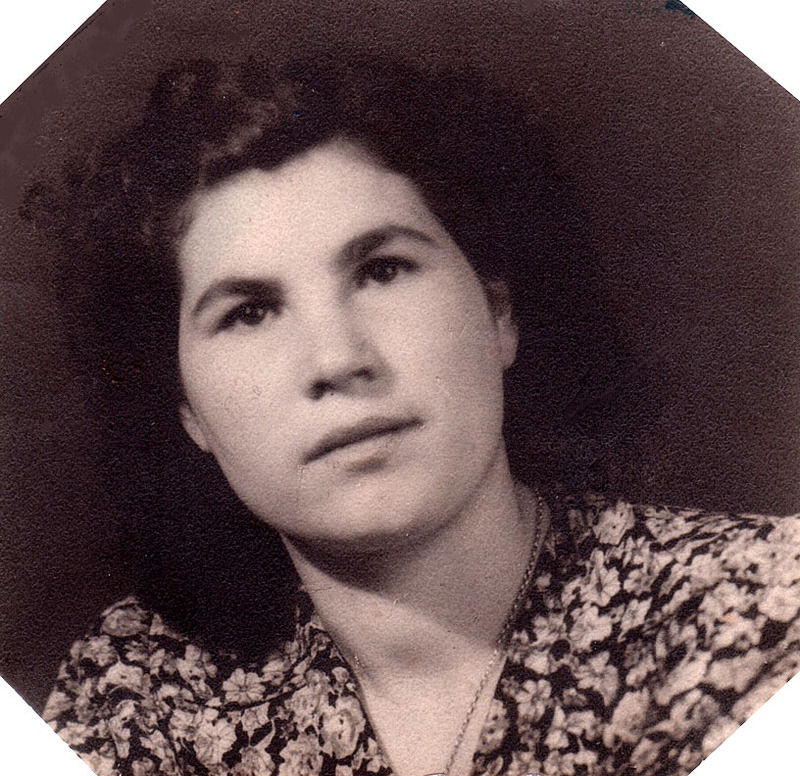 Happy Mother's Day, everyone, and special loving memories to my own mother, Rose Capaccio Alfonsi. My mom looved to read, and I loved that she read to me! 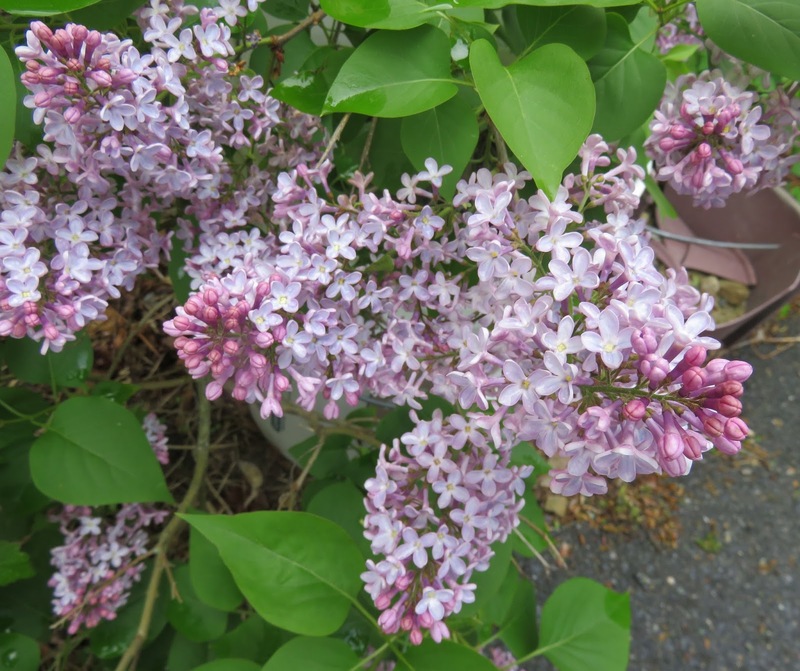 Great blog for Mother's Day! Our family is lucky to still have Mum active at 94 and cooking up a storm in the kitchen. She taught my sisters and I from childhood that cooking is a creative art as well as nutritional need. And she is famous for her steak and kidney pie and English plum pudding. She has the right idea. Food should give you pleasure to prepare, and give others pleasure when they eat it.